The Basel draw is out and Roger faces Frenchman Jeremy Chardy in the first round. There's no easing into this tournament it seems as Chardy is quite a good player and capable of playing at a high level. This will be an interesting match I believe, they've never met each other before and this year Chardy has beaten Murray and Tsonga which are very big scalps. I expect Roger to win but it's bound to be a test and we'll also see what kind of form he's in after losing to Murray in Shanghai. He looked pretty shaky that week so will he have got his swagger back in his hometown? Who knows but I'm looking forward to finding out. Basel is on of my favourite tournaments, a nice stadium in a cool country what else can you ask for? If the draw goes to plan (it won't) then Federer is seeded to meet the following Bellucci/Soeda, Lacko/Seppi, Wawrinka/Troicki, Youzhny/Del Potro. With that I fully expect him to make the final. The two interesting ones in that potential list are with Wawrinka; will he go all out to beat Roger after he should have beaten him in Shanghai. And the other is Del Potro; he's come close to beating Roger a couple of times this year but fallen short, however if you watched Shanghai you get the sense Roger is weak right now so that could give Del Potro some encouragement and the edge he needs if they play. I was a ball boy. It ‘s always nice to play at home. I remember my match against Andre Agassi, which was obviously not a match I could win at the time, but I was happy to be on center. Basel has given me joy and pain. The most difficult time I had was the final against Enqvist, I played a good match but he was amazing . When I lost, during the awards ceremony I began to see all black in front of me, I thought that I would never win a tournament. In 2006, against Fernando Gonzalez, I finally was able to realize my dream. No surprises here as Murray withdrew from Basel for the second consecutive year. He looked dead on his feet after the Shanghai final against Djokovic and like I said many moons ago his body is going to become increasingly fragile. Murray was bound to be one of the biggest hurdles to Roger winning a 6th Basel title so with his withdrawal it means he's no longer standing in the way. Nishikori was last years beaten finalist so he's abit of a loss as his game is quite good to watch. I doubt he'd have mirrored his performance last year but after winning Tokyo you figure he may have made the Quarters. Fish is always dangerous on hard courts too so that also makes Roger's tournament a little easier should they have played. Will Roger play in Bercy? I hope to be able to play three tournaments in three weeks. Certainly after Basel I will play in London, then I will think about what to do regarding Bercy. I have to evaluate my form. I guess it's still undecided but I don't see much point playing it. Anyway, we'll find out after the Swiss Indoors. Back to Basel and Roger plays on Monday. I think it's the night match so the Swiss crowd are in for a treat and it's also the peRFect time for me to watch which I'm extremely happy about because Cincy, US Open and Shanghai are all a real killer to watch. 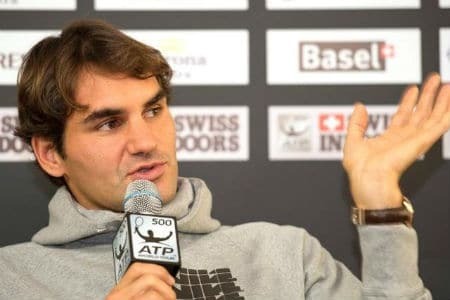 Do you think Roger will win a 6th Basel title? Let me know in the comments. Good! Looks like a 6th Basel trophy is knocking at the door! I fancy Roger’s chances a tad better with Murray’s w/d. Don’t care about #1 ranking if Roger wins the WTF!!! Tough draw though, Wawrinka must surely go all out to win. Del Potro no pushover either. Will be really interesting to see what his form is like after Shanghai. It’s not an easy draw for him, as he struggled against Belluci in Indian Wells. Hopefully he will find the inspiration playing at home again. I don’t think Bellucci will be a threat on an indoor court, low bounce will mess up his game. Wawrinka and Del Potro are the 2 I think could be tricky. Although maybe Wawrinka doesn’t have the belief after Shanghai. Not an easy draw, but the fact that Murray is out will give him comfort. He loves playing in Basel and hopefully that will give him some added encouragement. Yeah Murray has made it easier. I want him to win this title to restore some confidence. I think Roger is going to do a good job and will take this event seriously. He needs the boost in confidence and I think if he wins he will play Bercy. I hope he can manage to find his form and consistency and parlay that over to the WTF. Roger has gifted us a great year and shall he fall short at Basel or WTF it wouldn’t bother me in the least. Winning this and WTF would be a great season, almost prime level. I’m pretty, pretty confident Federer will add another shiny trophy to his collection. If he’s ok, I hopé he can play and win the whole package, like last year. Just for the sake of increasing his legend. I’m not that worried about YE#1, I think Djokovic already has it on the bag, but I also think Nole isn’t playing THAT amazing. I mean, his shanghai final was pretty impressive, but nobody said Murray choked SO BIG, Djokovic wasn’t unbeatable that match. Having said that, I think Djokovic won’t defend his AO trophy, Murray or Roger will take it, and then is a big moment for Federer to take #1 again. Not bothered about year end either too much but I’d like him to win Basel. I think the Fed will win! He will do it for his country and his pride. He can if he is In the mind set at any time. Humans just do not wake up in the same mode everyday! Yeah guess he’d rather play a 1000 than a 500 if it wasn’t Basel. Well, if he doesn’t play Bercy, that’s a 1000 points lost in the rankings. I know he needs to have more R&R, so it should be fine to skip Bercy but if Murray wins that one, then I think Murray may be getting too close to Roger in the Race points standings. Murray may play well in the WTF with the home support so he might be finalist there. I don’t think Roger will fancy playing next year’s Australian Open as the third seed in the middle section of the draw so he can’t really afford to lose another match this year which is very very difficult for anyone’s standards. Lets hope he can! I think he will skip it though but I can’t see Murray winning Bercy or WTF but who knows. I hear “I’ll have to evaluate my form” as “If I lose in the first few rounds of Basel I’ll have to go play Bercy”. He’ll want to make sure he’s in form and confident going into London. If Basel gives him that then I doubt he’ll see a real need to play Paris. Unless the No. 1 ranking means that much to him. “On 5th of December Novak Djokovic is going to turn beck on his tron. This data is not picked up just like that and it is not someone’s wish. First Monday of November, ATP is going to take points from the players. This points will be from Basel, Paris and London, so Djokovic is going to be No. 1 again. Does anyone know something about this points deleting?